Solar of Mamamoo will soon create her own YouTube channel, the singer said Saturday in a V Live broadcast in Thailand. “I have been preparing for two months now to start a YouTube channel. I have been studying for two months now the skills required to become a YouTuber,” she said, livestreaming while sitting on a toilet seat in a hotel room. She aired the broadcast from inside the bathroom because of the lighting. The livestream was started by her bandmate Moonbyul -- her roommate for the day -- while Solar was away. “I have put on makeup for an interview today and so I turned on the V app. I didn’t want to just go to bed,” Moonbyul said at the start of the broadcast. While on air, she visited the room that two other bandmates -- Hwasa and Wheein -- were sharing. The three had a lively chat with fans there before Moonhyul returned to find Solar was back. Watch Mamamoo’s broadcast at https://www.vlive.tv/video/110644. 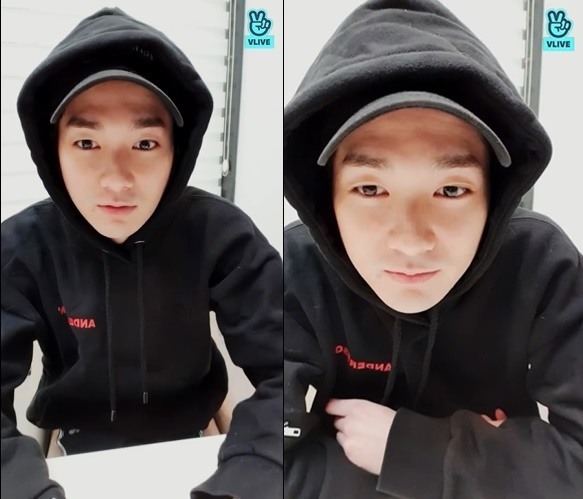 Aron of K-pop band NU’EST bonded with fans on V Live on Saturday, sharing his preferences on food, movies and music. The member of the five-piece band read comments from viewers and answered their questions during the 30-minute livestream. He said that he has two pet dogs; likes to listen to rhythm and blues songs; doesn’t like horror movies; and thinks sometimes in Korean and in English. “It’s interesting. Like two years ago, I dreamt only in English. But now, I sometimes dream in Korean and sometimes in English, about half and half,” he said. Aron was born and raised in Los Angeles, California. Watch the broadcast at https://www.vlive.tv/video/110713. Rookie girl group Cherry Bullet aired a V Live broadcast after its first appearance on a TV music show since its debut. The 10-piece band under FNC Entertainment released its debut single, “Let’s Play Cherry Bullet,” on Jan. 21. “We had our very first music show performance today. It was really nice to hear fans cheering for us,” Haeyoon said. The bandmates said they were waiting for their first autograph session to begin. “I don’t know what to say to fans when I meet them,” Jiwon said. Watch the broadcast at https://www.vlive.tv/video/110715.